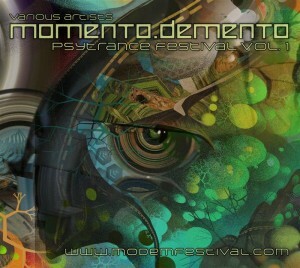 Momento Demento Psytrance Festival Vol. 1 celebrates the second edition of our psychedelic music and art festival. Set in the beautiful, idyllic landscape of Croatia, this festival supports full power underground music at its best. The ethos behind the festival is to bring you fresh psychedelic sounds in amidst the most beautiful natural surroundings and friendliest vibes. For this release we hand-picked some of the top artists from this year’s line-up to bring you a powerful compilation that will prepare you for what’s in store at Momento Demento 2013. Mastered by E.V.P. at Wild Mastering with artwork by Android Jones. MP3 Download | FLAC Download | WAV Download · Download count: 34,911. Not a bad bunch of blokes coming together to jam things up! This is a blazing collection, and after a while, I had to pace myself because of brain freeze! Good stuff, here. killer va !! see u at festival ! Давненько не слышал хорошего добротного ночного транса! Very nice! Nice, crisp, clean, high energy, psychedelia!!! Nice one guys! Thanks from Cape Town/ London! Awesome cover art by the way. Love it! Same as the Modem cover! Compliments to the artists!! They compliment the music perfectly! cant download the album for some reason. it keeps failing. really liked the music. how do i download it? any other link? Biomechanical and Da Blah are my faves.